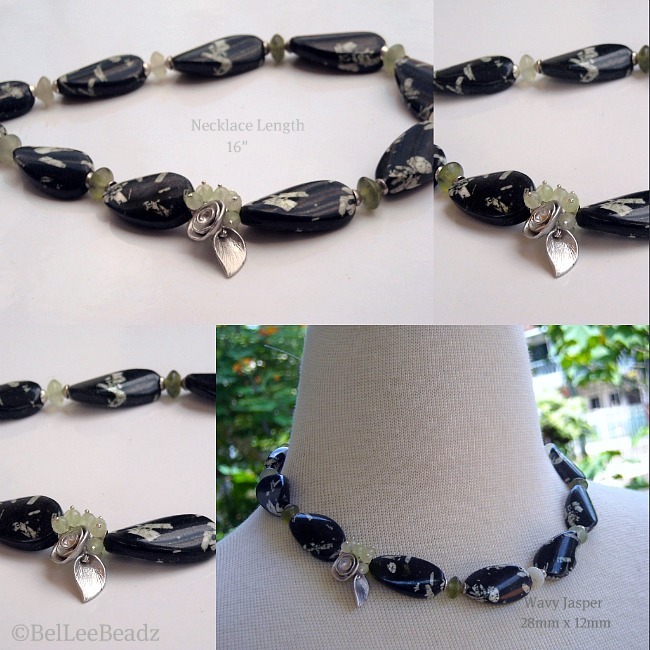 Gorgeous little piece this surely is - wavy black jasper beads with cream to green dashes. These beads are called Chinese Writing Stone Jasper....quite apt if you see them close up. Like the strokes in chinese calligraphy. In between, I've used sterling silver bead caps, little jade smooth rondells and for the focal, a cluster of faceted round prehnite and silver tone flower/leaf combo. Belinda! its more like "aaaaaaaargh" You did ALL this, with the pretty little details and all, whilst talking to me, oh lawd ... you're so fast ... And its already photographed & uploaded ! You're one amazing person and a wonderful friend. It was fun, and a total pleasure catching up with you again :))))) Cheers !